Find hotel near Arulmigu Marundeeswarar T ..
A Lord Shiva temple, the Marundeeswarar temple is a major draw of visitors owing to its cultural and religious significance, along with a beautiful location, adjacent to the Bay of Bengal. It’s being as one among the “275 Paadal Petra Sthalams” holds high importance relating to the 7th-8th century. In the 11th century the dynasty of the Chola rulers further expanded it, with very ruler-like attributes to the temple like a huge tank and seven-tiered gateway towers. The temple has been a place of worship for people with various diseases. It is one of the famous Trinity Sea Shore temples of Thondai Mandalam, along with Kapaleeswarar Temple and the Thiruvottiyur Thyagarajaswamy Temple. How popular is Arulmigu Marundeeswarar Temple? People normally also visit Ashtalakshmi Temple while planning their trip to Arulmigu Marundeeswarar Temple. One of my favorite temples in Chennai to visit, it's been here on Chennai for so much years! Has so much heritage to it and history. A true calm and serene experience. It's vast and also very very beautiful. It also gets very festive during special days. Well maintained. One of the oldest temple in the city. Sea shore is nearby. Easily access from any part of the city both by train and bus. One of the ancient temples in Chennai. The temple is devoted to Lord Shiva. It's peaceful to visit the temple. Carnival festival happens in March which is very famous. 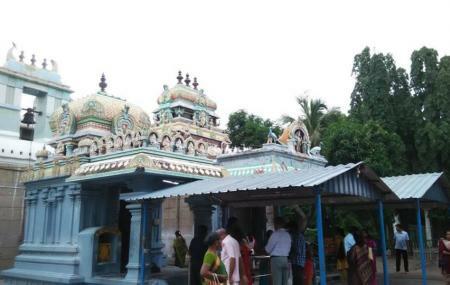 1000 of people from parts of Chennai seek darshan here. A picture of the charriot is posted.